My temptation whenever I review a children’s book that involves a dog in some way is to begin with a caveat that I am not a dog person. I’ve drawn from that well one too many times, though. At this point I think my I-am-not-a-dog-person credentials are well and truly established. However, it wasn’t until I read the utterly charming Lucy Rescued that I realized something. I am not a dog person but I am a new mom and it would appear that the buttons that are pushed by babies in distress can also be pushed by pups in equally scary, lonely situations. That’s not going to affect the kids who read this book, but they will be able to relate to it in a far more direct manner. Here we have a book about a dog coping with the misery of loneliness. Kids understand loneliness. They understand needing a toy to comfort and cuddle. They understand what happens when that toy disappears. So here we have a book that both adults and kids will relate to. It may be in different ways, but the end result stays the same.A little girl and her parents adopt Lucy the dog from the pound. All seems to be well until the pup begins to howl. And howl. And howl some more. Various solutions are suggested and tried. Perhaps Lucy is lonely for other dogs? A mirror doesn’t work. Maybe she would like her own doggie bed? One is purchased and summarily rejected. Doggie therapy? Ha! When our heroine’s parents lay down the law and say that Lucy needs to quiet down or she’s going back to the pound, that’s when things get real. Fortunately the little girl has an idea. Offering Lucy one of her stuffed animals she successfully determines that this was the answer to everyone’s prayers. After that Lucy is given a range of stuffed friends. She’s perfectly content at that point, but woe betide you if one happens to go missing. The title of the book is Lucy Rescued but Lucy’s initial rescue from the pound happens essentially on the first page. Why name the book something that’s so fleeting in the story? Probably because the true rescue here isn’t the physical one from the pound but rather the rescue of the dog from her own unhappiness. Not that it’s easy. It takes a child to see through the dog’s howls and to the solution to her misery. Ziefert, as it happens, based this book on actual dogs that she herself was familiar with. In her experience she knew a dog that could not go to bed at night unless all its Beanie Babies were present and accounted for. Dogs can’t count, but if even one Beanie was missing the pup was reduced to a sad little puddle. You would not be amiss if you considered for a second or two the possibility that the French are taking over American children’s publishing. How else to account for the magnificent books brought to our shores from the likes of Herve Tullet, Martine Perrin, Blexbolex, and many others? Barroux is a little different in that in his books he illustrates American children’s authors like Ms. Ziefert. This book was originally published in the States, then. Not France. In this particular title Barroux fills his images with for some clever details. For example, he highlights his characters by leaving an unpainted areas around their bodies when they stand against colored walls. It’s a way of drawing your eyes to the people of the story without drawing attention to the fact that you are drawing attention. Then there's the dog herself. Part of Lucy’s visual charm is that she is utterly expressionless in the midst of all her howling. On occasion, when she’s particularly dejected, her eyes will turn from straight dots into short little downward lines that somehow manage to reflect all the sorrow in the world. That is the range of her emotions, however. I also enjoyed the fact that Lucy’s cries or “WAH-OOO”s collect in crevices and puddle around the feet of the people who love her most. You can see piles of them on the seat cushions she’s vacated and swarms of them circling anyone who happens to get near. Finally, I liked very much that the cover of the book is a part of the story we don’t actually get see on the inside. Very small children and pets have a lot in common but the most frustrating similarity is that neither has the language to describe what they want. Older children don’t tend care all that much about babies and their wordless states, but the fact that pets can’t communicate their needs is a very real concern for them. Lucy Rescued taps into that worry and the result is a lovely tale that shows that sometimes the easiest solution to a problem is the one thought up by a kid. A good pet book and a good kid book, this is one story that doesn’t have any difficulty with its ability to relate.Ages 4-8. This book would be a fine humane education tie-in with National Animal Shelter Appreciation Week or a similar classroom observance.Lucy Rescued follows a puppy who is adopted from a shelter (discussing the mechanics of shelter adoption). When However, when Lucy comes home, she is so scared and lonely she beings to howl. And howl. She howls so much that Lucy's new family is unsure how to help her, despite trying numerous methods to help her calm down. Finally, Lucy's young owner tries giving the pup one of her stuffed animals to sleep with--Bingo!This book is not only a celebration of a shelter puppy, it's also an entreaty to give new pets a chance instead of giving up on them. Puppies simply don't act like the perfect little fluffballs we see on TV. They make noise. They chew. They have accidents. Youngsters and heir families will be encouraged to see a new puppy in a more realistic way. Stumbled upon this at the Columbus Main Library. It's extremely cute.One of the nicest kids picture books I've ever seen and read. Perfect for introducing the concept of pet adoption to a toddler. This book also touches on the subject of pet misbehavior and how you can try different things to correct the problem. It also doesn't hurt that the dog that was adopted resembles Callie! L saw this book at the library and instantly decided that she needed "the puppy book". We read it together once and it was a cute story about making a new dog feel at home. L often looked this one over at naptime during the few weeks we had it home from the library. Lucy Rescued by Harriet Ziefert is about a dog, named Lucy, rescued from the pound by a family. They realized something is wrong with the dog when she howls non-stop. Finally, the little girl figures out that all Lucy needed was some friends. When she let her have her not so favorite toys anymore, she was happy again. I love how all the pictures are bright and colorful. The pages are thick too, to prevent easy tearing. The paintings in the book by Barroux are great and age appropriate! My favorite part of the book was all "howls" written all over the pages, almost like its infesting their whole house. I thought it was funny and pretty clever how Ziefert thought of that.I think this book would be a great nominee for the 2013 Caldecott Medal because of the unique and multicolored pictures in the story, as well as the excellent picture presentation it presents to children. I think it tells a great story as well, not just to give your dogs toys, but to rescue dogs from the shelter especially when their time is almost up. Another reason I think it is a great nominee is because this book is appropriate for all ages, but more specifically 4 and up. The concept and meaning behind this book is to rescue animals from the shelter and not buy them from puppy mills or other places, this can be a great lesson taught to children. 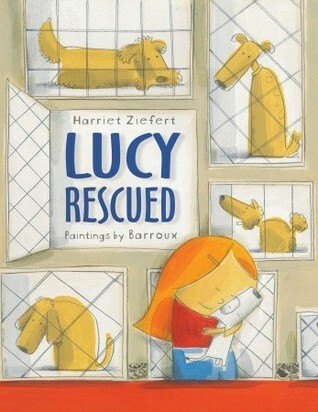 Lucy Rescued was written by Harriet Ziefert and was illustrated by Barroux. I chose to read this book because I enjoyed the pictures and the story the pictures told. This book is about a dog named Lucy who was rescued from the pound by a family and brought home. Once the Lucy came home the family started experiencing troubles with the dog and were faced with the issue of taking the puppy back to the pound. However, once the little girl discovered that all Lucy was missing was friends she helped Lucy become happy again. I thought this book would be a good nominee for the 2013 Caldecott Award due to the illustrations that can be found throughout the book. The illustrations were bright and colorful and really got the message the author was going to get across. I also really enjoyed how the pictures were painted instead of drawn. I am not sure if I would keep this book in my classroom but I do think that it would be a good book for children to read who were who were in first to third grade. Lucy , a small white dog, is adopted from an animal shelter just in time. But adjusting to her new home and family is tough on her and her new family. Lucy can’t seem to stop howling; she howls all day and night. In this sweet, simply but beautifully illustrated story, we follow Lucy and her family on their journey to love, understanding and acceptance. This wonderful picture book is perfect for sharing with preschoolers who will be certain to ask you to read it to them again and again.Sharyn H. / Marathon County Public LibraryFind this book in our library catalog. A charming story about how a family rescues a dog. "Here is Lucy at the pound, where we found her. She needed to be rescued. Her time was almost up." The first page may need a bit of explaining. Also, do we still call animal shelters pounds? I feel that pound has gone the was of orphanages -- there are better words to use today. But maybe that's just my experience with pet rescue and adoption! Anyway, Lucy has a tough time adjusting to life in a home until the little girl gives her a stuffed animal and begins Lucy's treasured collection. This story includes a lot of howling by Lucy WAH-OOOO-OOOOO so be prepared to put your best howl on for a doggie read aloud. This happened to be a book that was very timely for our family. Lucy's family adopted a dog who howled without ceasing; we got one who's too jumpy and mouthy. They found a solution in stuffed animal toys; ours seems to be in lots of training, snuggle time and exercise. I think it's a cute picture book that could be enjoyed by lots of people; not just those who have recently adopted dogs that required a bit more effort than expected. I do especially like that it shows how getting a new pet can be a big challenge! A perfect picture book about adopting a dog from a shelter. Lucy is distressed when she arrives at her new home and howls "wah-ooo-ooo-roo" no matter how her new family tries to appease her. That is, until her little girl companion discovers how to make Lucy feel comfortable and happy. As a side note, my sister's rescue dog, who was a breeder in a puppy mill, also liked to care for stuffed animals--so this fiction is true and touching. adorable, charming, and with a layered story of rescue to boot. What happens when you rescue a dog from the pound? For Lucy, that's not the end of her problems. It takes a child to finally understand why Lucy is still unhappy and to get her to settle into the family. The illustrations are really cute and detailed, and I am - forever - a huge sucker for a dog story. This book really caught my eye by the cover and the title. It's a sweet children's book, discussing the adoption of a family dog and the struggles that occurred afterwards. I really liked how that dog continued to howl and after they finally figured out what the dog wanted, she finally found her place at home with the family. Cute, simple story. I loved what the solution would be. If I were a dog, that's probably what I would howl for! :-) 9 furry friends. Anyone think Lucy got a little spoiled? Oh well. She's a cute enough dog, how could one help it?Not sure if I'd do this in a storytime, but a lap-read would work well. Lucy is adopted from the dog pound and has a difficult time adjusting to her new home, that is until she makes friends with a cuddly stuffed animal. A great story about the processing of adopting/owning a dog when not everything turns out happily ever after. Simple story about a family that gets a dog from the pound. The dog isn't happy as it keeps howling all day and night. The girl in the family works to find a way to calm the dog so they can keep her. I loved the illustrations that tell the story just as well as the words! I had mixed feelings about this book because I don't want a dog but my boys do. It would be a great book to show why I don't except that it ends "happily" and I know my children would say we could try what they did in the book. I very much enjoyed the beginning of the story of a family getting a dog from the pound and trying to figure out what she needs to be happy, but the last third of the book didn't strike me as true to life, and I actually felt that it could have done without. I get a headache just reading about Lucy's constant howling. How they get her to stop (and all the things they try) are clever and interesting. Illustrations are OK, but wasn't really my thing. Overall, it's a decent book, but not one I would seek out. Absolute favorite detail: the way Lucy's mournful "wa-ooos" collected in eddies and piles all over the place. Great way to show the unrelenting nature of the howls. Gentle story, not a lot of tension or major events, but a nice resolution for everyone. Lucy may have to go back to the pound if she doesn't stop howling. What is it that makes her cry endlessly?? Her new owner is desperate to make her little dog happy before her parents return her. Cute book about the possible responsibility of bringing a new pet home. Cute story. I like how the howls permeate everything in the illustrations. This could be my favorite Ziefert title. Lucy is a lucky dog. Ah, dog neuroses. What's not to like? Harriet Ziefert Barroux - Harriet Ziefert grew up in North Bergen, New Jersey, where she attended the local schools. She graduated from Smith College, then received a Masters degree in Education from New York University.For many years, Ziefert was an elementary school teacher. She taught most grades from kindergarten to fifth grade. "I liked it," she said, but she stopped teaching when she had her own sons. When her children were older, Ziefert wanted "a bigger arena" for her work. She went to work at a publishing company, in New York City, developing materials for teacher's guides for kindergarten language arts and social studies programs. "About twelve years ago," says Ziefert in a 1995 interview, "I tried to get a job as an editor, but no one would hire me as a trade editor. So I decided to write my own books." Since then, she has written several hundred books, mostly picture books and easy-to-read books. "I write books very quickly," she says, "in about twelve hours. I rewrite them three times over three days, and then they're done." She writes about twenty books a year.